We Orthodox do not find salvation by figuring out, mastering, dissecting, or analyzing Christian life. Study is very important, but submission is essential - submission of our earthly minds to the mind of the Church and, therein, to the mind of God. 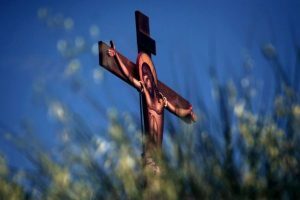 Why, after five consecutive Sundays focusing on Christ and His miracles, do we suddenly switch to the First Ecumenical Council, an event that took place three hundred years after the subjects of the previous Sundays? Up until the Feast of Ascension, each Sunday after Pascha focuses on Christ in the midst of humanity, tangibly and physically present. We see Him walking the earth, teaching, touching, listening; bound, beaten, crucified, entombed; resurrected, scarred, and even eating. But now, Christ has ascended! And for the first time since His Nativity, Christ is not visible to human eyes or tangible to human hands. With the Ascension of Christ, the Church wisely turns our attention from seeing and touching Christ to the higher calling of believing in Him. Our experience is transferred from the body of Christ as visible Man to His continued mystical presence on the Earth as His Body, the Church. Christ now heals and saves all men everywhere by way of the Church, as experienced and defended by the Fathers of the First Ecumenical Council. This council was held in Nicaea in the year AD 325. At the time, controversy caused by the heretical teachings of Arius prompted Emperor Constantine to arrange this first council in order to restore unity in the Church and establish a common creed. Over six hundred representatives were present at the council, three hundred of whom were bishops. 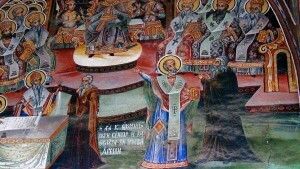 Notable figures at the council included St. Athanasius and St. Ephrem (both deacons at the time), and St. Nicholas of Myra. There are many “Christian” expressions in the world today, but only the Church of the Ecumenical Councils has maintained the teachings of Christ, as delivered to the Apostles, unchanged. 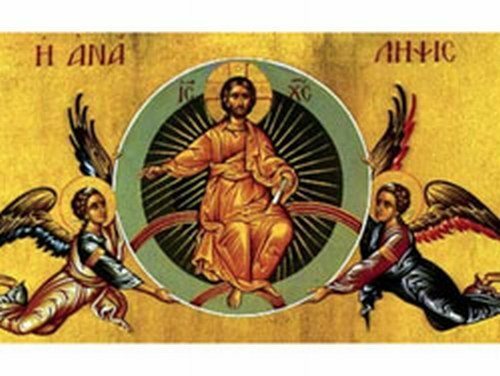 The Church of the Holy Fathers is the Body of Christ; the Church of the Holy Fathers is Christ in the form in which He chose to make Himself present in this world from the time of His Ascension into Heaven until His awesome Second Coming. This recognition of the Church as Christ present in the world falls between Ascension and Pentecost as a reminder that the Church holds not only the correct understanding of Christ but also His own power of healing and salvation, as preserved and invigorated by the descent of the Holy Spirit. In His Resurrection, Christ made possible the return of man to his pre-fallen state and his progress beyond this into union with God. Being membered to His Body the Church is the most powerful step in that return, and by the Grace of the Holy Spirit, the Church does not fail in its purpose despite the constant failings of the men within it. 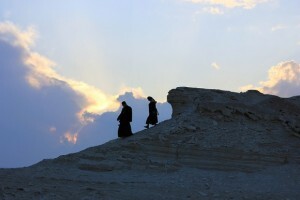 We Orthodox do not find salvation by figuring out, mastering, dissecting, or analyzing Christian life. Study is very important, but submission is essential – submission of our earthly minds to the mind of the Church and, therein, to the mind of God. When we submit to what has been delivered to us by the Church—who received it from the Fathers, who received it from the Apostles, who received it from Christ, who ascended into Heaven and sent the Holy Spirit, who ensures the permanence of right belief—we are submitting to the same healing and salvation at the hands of Christ as did the paralytic, the Samaritan woman, and the man born blind. By submission to the teachings of the Church, and by nurturing the seed of the grace of the Holy Spirit planted in us at baptism, we have the potential to be transformed into Christlikeness, to become “little Christs,” as experienced by the Apostles and saints. The task of nurturing this seed of holiness is not an easy one. The seed longs to grow vigorously, but its portion of fertile soil in our hearts may be very small. Yet with submission to the teaching of the Church, in actual, consistent, daily practice, the seed begins to grow. For this submission to the mind of the Church is the $rst fruit of faith—real faith. In practicing faith, we experience the first rays of divine light that nurture the seed of the Holy Spirit within us and preserve what the Holy Fathers of the First Ecumenical Council so faithfully delivered to us that we may be saved.